Will The New York Times Die? Newspapers are collapsing — and fast. Circulation is plunging. Ad revenue is dropping precipitously. Staffs are being slashed. Papers are folding. Others are declaring bankruptcy. But that's not the news. The real story is, What would the demise of newspapers mean for every American? A strong nation needs a robust press to inform its electorate and monitor its government. America will change radically as daily newspapers across the country are simply wiped out, says a stunning report in Newsmax magazine. 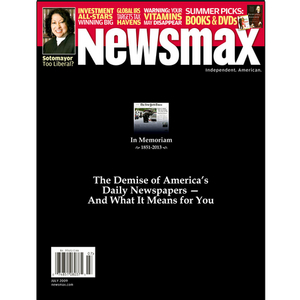 Newsmax magazine's special report "The Demise of America's Daily Newspapers — and What It Means for You" takes a probing look at the travails of our daily newspapers in the age of the Internet, and poses this question: Can newspapers be replaced? We offer some surprising answers. Bill O'Reilly: a new take on Obama?